Known for fun and excitement, this city in the desert serves up all kinds of possibilities for travelers. The Strip, Las Vegas' famous resort-lined street, sparkles with lights and recreated glamorous sites from cities around the world. Many of the hotels are attractions in and of themselves and feature free streetside shows, from dancing fountains to erupting volcanoes. You'll also find unique museums, an always impressive list of shows, and countless other things to do. The Grand Canyon is just a short helicopter ride away, and the surrounding hills and mountains are home to all kinds of recreational opportunities. For a great aerial view over Las Vegas, or even the Grand Canyon, visitors may want to take a helicopter ride. Las Vegas has a number of companies providing helicopter tours that take visitors over Las Vegas and the Strip, or as far away as the Grand Canyon. This is a great opportunity for anyone with limited time to see not only Vegas, but the surrounding landscape and one of America's most impressive and famous natural attractions. 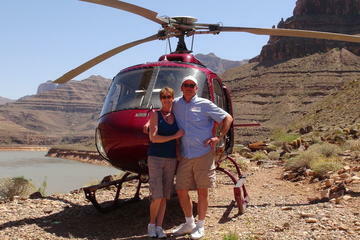 If you have a full day for exploring, try a 6.5-hour Grand Canyon 4-in-1 Helicopter Tour. The Venetian Hotel in Las Vegas is located on the Strip, across from Treasure Island. It is one of the city's finest resorts and has many interesting tourist attractions. Inside is a themed shopping arcade built to resemble the city of Venice, complete with blue skies, canals, and gondoliers. The hotel also features recreations of the main attractions found in Venice, such as the Rialto Bridge and the Bridge of Sighs, along with many others. Located on the Strip, Paris Las Vegas is one of the most easily recognized resorts in the city. Out front is a scale model of the Eiffel Tower, and down the way is a recreation of the Paris Opera House. Forty-six stories above the city streets, the Eiffel Tower Experience is an observation deck with incredible 360-degree views. One story below this is posh and romantic Eiffel Tower Restaurant, with fine views out over the Strip and across to the dancing fountains of Bellagio. Also on the property is a mock hot air balloon festooned with neon and flashing lights. The Bellagio Resort in Las Vegas is a massive, high-end hotel complex, with a wide variety of attractions, including the Bellagio Gallery of Fine Art, the Conservatory & Botanical Gardens, a spa and salon, and some of the finest restaurants in Las Vegas. Beyond the lobby is a showroom area with changing themes that range from spring botanical displays to fascinating shows of art. The most impressive and famous feature is the fountain show. In front of the Bellagio, along the Strip, the dancing fountains perform a beautiful display of water set to music. From the sidewalk, visitors have a ringside view. This is often described as the best free attraction in Las Vegas. The New York-New York Hotel in Las Vegas is across the street from both the MGM Grand Hotel and the Excalibur Resort Hotel. Visually stunning, the hotel is designed to appear like New York's skyline, complete with the Brooklyn Bridge and the Statue of Liberty. A huge roller coaster circles in and around the hotel. Perhaps one of the best known of all the Las Vegas hotel resorts, Caesar's Palace continues to evolve. Currently Caesar's Palace is a massive complex in the middle of the Strip, complete with every imaginable entertainment option. The hotel is closely associated with shows held in its huge concert venue known as "The Colosseum." Top performers (which have included Celine Dion and Elton John) perform here for extended periods, and shows are often booked out well in advance. Visitors planning a trip and hoping to see a performance here will want to check out dates and ticket availability as early as possible. The Mob Museum, or the National Museum of Organized Crime and Law Enforcement as it is officially named, is a truly unique and standout museum in Nevada. The museum is housed in a 1933 Neoclassical building, formerly the US Post Office and Courthouse, that has its own history. It was one of the locations for the famous Kefauver Committee hearings in 1950, which revealed some ugly truths about organized crime in Las Vegas and across the US. The bright and colorful neon signs of Las Vegas have been one of the city's most memorable sights for countless visitors throughout the years. These multi-story advertising beacons became one of the city's claims to fame. Today, the Neon Museum is working hard to preserve some of the city's history by purchasing, storing, and in some cases, refurbishing the historic neon signs that have gone by the wayside as businesses have faded or new signs have taken the place of older icons. You can see many of these signs by taking a guided tour at the Neon Museum, where old neon signs are stored outside in a large compound. Guides provide the history of the signs and designs, which have evolved over the years. Efforts at the museum are ongoing, and signs stand in varying conditions. In some cases, only a portion was saved or found, while others have been restored to their former glory. This contrast makes the museum that much more interesting and gives visitors insight into how much work and upkeep is required with these giant signs. Another distinctive theme hotel, at the far southwest end of the Strip, is the Luxor Hotel. Designed in an ancient Egyptian theme, the hotel is shaped like a pyramid, with a sphinx proudly gazing out over the street. The Luxor, like all the major resorts, offers a wide variety of restaurants and shopping opportunities. One of the standout features of this hotel is the beam of light that projects from the highest point of the pyramid and shoots up into the night sky. It can be seen from throughout Las Vegas. The Stratosphere Tower is an unmistakable sight on the Las Vegas skyline. The tower rises up 1,149 feet, and on the rooftop of the tower are a variety of heart pounding thrill rides, including the SkyJump, Big Shot, X Scream, and Insanity. For those looking for a little less drama, there is an indoor and outdoor observation deck with great views over the city. The Stratosphere Tower claims the "tallest freestanding observation tower in the USA." The MGM Grand Hotel in Las Vegas is across the street from the New York-New York Hotel and kitty corner to the Excalibur Resort Hotel. The MGM Grand Hotel has all the amenities visitors would expect to find at a luxury hotel including above average accommodations, an exceptional pool area, a multitude of restaurants, and plenty of entertainment options. One of the hotels popular activities is CSI: The Experience, based on the popular CSI TV series, where participants can test out their detective skills. Madame Tussaud's in Las Vegas is near the escalators leading up to the Venetian Hotel on the Strip. Here, visitors can see their favorite stars preserved forever in wax. In many cases, the figures are so lifelike it is almost eerie. Figures range from Elvis to Bradley Cooper and Sofia Vergara. The overall focus or theme of Madame Tussaud's is on people who are associated with Las Vegas. Fans of fast cars will want to head over to the Las Vegas Motor Speedway. Located in Clark County 15 miles northeast of the Strip, the Las Vegas Motor Speedway is a 1,200-acre complex of multiple automobile racing tracks just right for the speed-freak in you. The Las Vegas Motor Speedway is home to NASCAR races, as well as a number of other racing events. Several speed records have been set at the track. The Speedway features multiple restaurants, and for those wishing to stay overnight, camping is available. Check the website for the latest upcoming events and pricing. The Excalibur Hotel in Las Vegas is another theme hotel on the Strip. Decked out in medieval character, the hotel features some wild architecture, complete with turrets. The hotel has all the amenities a visitor could possibly imagine, with varied entertainment, a huge pool area, and a good assortment of restaurants. Since most of the action in Las Vegas is focused around a portion of South Las Vegas Boulevard knowns as The Strip, staying on or close to this area is the best option. This is also where most of the huge, themed resort hotels are found. The price of hotels can vary greatly from one week to the next, with rates skyrocketing around big conventions and great discounts available at slower times. Below is a selection of highly-rated hotels in good locations. Luxury Hotels: The Italian-themed Bellagio, easily recognizable by the lake and dancing fountain show in front of the resort, and the Venetian, a recreated Venice-themed complex complete with a canal and gondolas, are both luxury resort hotels in prime locations along The Strip. Caesars Palace, also with a great location along The Strip, is a long time classic in Vegas, and home to the famous Colosseum entertainment venue. All of these resorts have wonderful pools, shopping, and entertainment on site. Mid-Range Hotels: At the north end of The Strip is Treasure Island, with a nice pool area and a good location within walking distance of the major sites. This is an upper mid-range option that often has reasonable prices. Also in this category is the Monte Carlo Resort. This is a quality hotel in a great location that also frequently offers reasonable rates. The Hilton Grand Vacations Suites on the Las Vegas Strip is another quality hotel but it lies a little too far north to walk to the main section of The Strip. Budget Hotels: The Excalibur is a formerly grand but now somewhat dated resort hotel that often offers good deals. It has a nice pool area and a great location at the south end of The Strip, near the New York, New York. Across the street from the Excalibur, but just off the Strip on Tropicana Avenue, is the Motel 6. This is a basic motel with a pool and an excellent location. The Travelodge Las Vegas Center Strip is another decent budget option, with a good central location slightly off The Strip. Just beyond the lights and electric vibe of Las Vegas is a spectacular landscape of gorges, red rocks, mountains, and desert scenery. If you have time, be sure to get out and see the sites beyond the city limits. Grand Canyon and Hoover Dam: The two biggest attractions in the Las Vegas surrounding area are these two fantastic sites: one natural, and the other, man-made. The Grand Canyon and Hoover Dam Day Trip from Las Vegas takes visitors, by coach, to the West Rim of the Grand Canyon for three hours of free time. This allows plenty of time to walk along the rim and gaze out from the viewing areas. 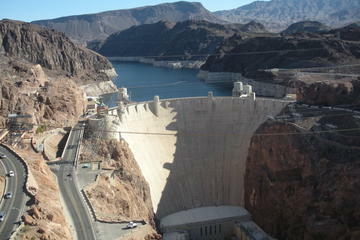 A short stop at Hoover Dam along the way is also included. Add on a helicopter and boat ride or a stroll on the Grand Canyon Skywalk as optional extras. Red Rock Canyon: Take a four- or six-hour guided Red Rock Canyon Tour to see some of the spectacular red rock scenery and views out over the desert and mountains. This tour offers hotel pickup and drop-off, a tour of the canyon along the 13-mile scenic loop road with stops at the lookout points for the best views, and a boxed lunch. Hiking and Camping: You can find some great hiking trails in the surrounding desert and mountains. For some unique experiences see our articles on the best hiking trails in Valley of Fire State Park and best hikes near Las Vegas. If you are interested in spending a night or two under the stars, and you haven't brought your own camping equipment, you might want to consider a fabulous 3-Day 2-Night Camping Tour from Las Vegas to Zion, Bryce Canyon, Monument Valley, and the Grand Canyon. This fully escorted camping trip takes you to the major highlights of the Southwest and includes Jeep tours, and the option for a helicopter ride over the Grand Canyon. If you have your own camping equipment and are trying to figure out the best places to set up camp, see our list of the best campgrounds near Las Vegas. Self Drive Excursions: Explore nearby towns and incredible natural areas with our Top-Rated Day Trips from Las Vegas article.